When we apply the same approach to EMC XtremIO clusters (two or more X-Bricks, 8 maximum), we should also consider another limit, the ‘Number of total paths on a server‘ which is 1024. With two X-Bricks, you have four controllers, multiply by two HBAs and you have eight paths per LUN. Therefore the max number of LUNs will be 128 LUNs (1024 / 8 = 128). The following diagram displays the logical connection topology for 8 paths. If you go to the extreme and configure your XtremIO with eight X-Brick, you have 16 controllers. Again, two HBAs per host and the max number of LUNs you can attach to an ESXi host will be 32… I understand, different OS’es may have different limits than VMware and this logic will not be applicable. 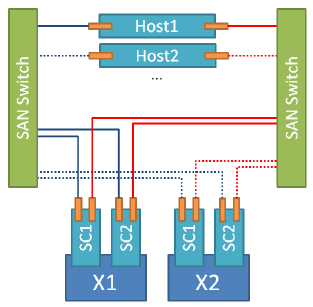 If you have hit the limit of 1024 paths per host (1024 / 4 controllers / 2 HBAs = 128 LUNs) and need to provision more LUNs, the best way will be to re-zone the host to limit the number of X-Bricks / Controllers the host HBA can connect to. 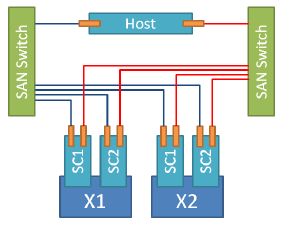 The following diagram displays the logical connection topology for 4 paths. OK, let see how to reconfigure the zoning. Please refer to ‘HOW TO: Configure smart zoning on Cisco MDS 9148s‘ blog post to see how it was configured in the first place. The idea is to configure one HBA to one X-Brick zones therefore I will create an FCalias for X-Brick1 and X-Brick2 (X-BrickN, if you have more…). Rescan HBAs and confirm the number of path has changed.